Using a Blastrac rigging system increases the total performance of the machine without interfering with other trades working disciplines and also helps to reduce total square meter costs compared with compressed air powered blast cleaning, or high pressure water blasting. 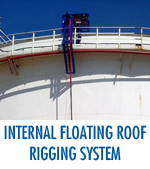 Comparing the use of a rigging system on a cone or domed roofed tank, as well as the internal or external surfaces of the shell of a floating roofed tank, with the alternative to using a mobile crane shows up the many advantages of a rigging system. 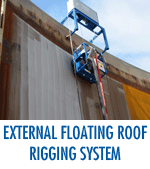 It allows the operator to control the movements of both the rigging system and the vertical blast cleaning machine from a mobile control station, where the operator has the perfect control for travel speed of the system and an overview to execute and control the job he performs. 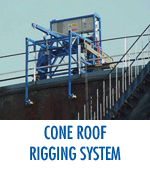 Blastrac rigging systems are made with high grade components and include all the necessary certification. 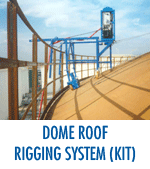 Assembly time on job site is extremely short, because the whole system consists of 5 major components.